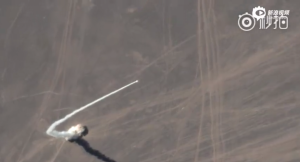 A satellite orbiting 332 miles above Earth recently captured some neat footage of China’s OneSpace startup launching a rocket from the Gobi Desert. As cool as the video is, OneSpace was merely testing the solid-fueled booster of its OS-X1 rocket, reaching a suborbital altitude of 21.7 miles after taking off from the Jiuquan Satellite Launch Center. OneSpace CEO Shu Chang aims for the company to be “one of the biggest small-satellite launchers in the world,” aiming for 10 launches in 2019. The company hopes to launch its first orbital flight later this year.